Two market trips today, as this was also my monthly meat CSA pickup day. New vegetables appeared for the first time this week, and a few are already on the way out. Cucumbers (new, time to make pickles! ), carrots (finally a usable size), sugar snap peas (the last of the season as they turn into shell peas), baby yukon gold potatoes (first of the season), cherries, raspberries, strawberries, cherry tomatoes, and the elusive triple berry pie. I noticed that two people – a chef and her manager – were just ahead of me at each stand I visited, buying up huge amounts of produce: fava beans, garlic scapes, baby potatoes, and summer squash. They were Mary Catherine Diebel of Upstairs on the Square and one of her chefs, buying for the evening’s menu, which they would plan around the day’s purchases. We talked about the local restaurant business, and they recommended a few places I should try. 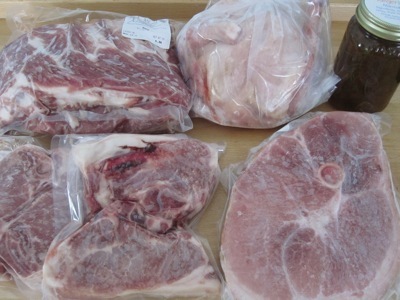 I had just enough time to put away my veggies before driving to Cambridge to pick up this month’s meat share: two racks of spare ribs, a chicken, a ham steak, pork chops, and a jar of tangerine-lime marmalade from Hi-Rise Bread Company. (I must occasionally satisfy She Who Must Be Obeyed’s marmalade craving.) So, it looks like toast for breakfast and barbecue for the holiday weekend. Maybe I’ll bust out a Bacon Explosion while I’m at it. This entry was posted in food & cooking and tagged food, market. Bookmark the permalink.